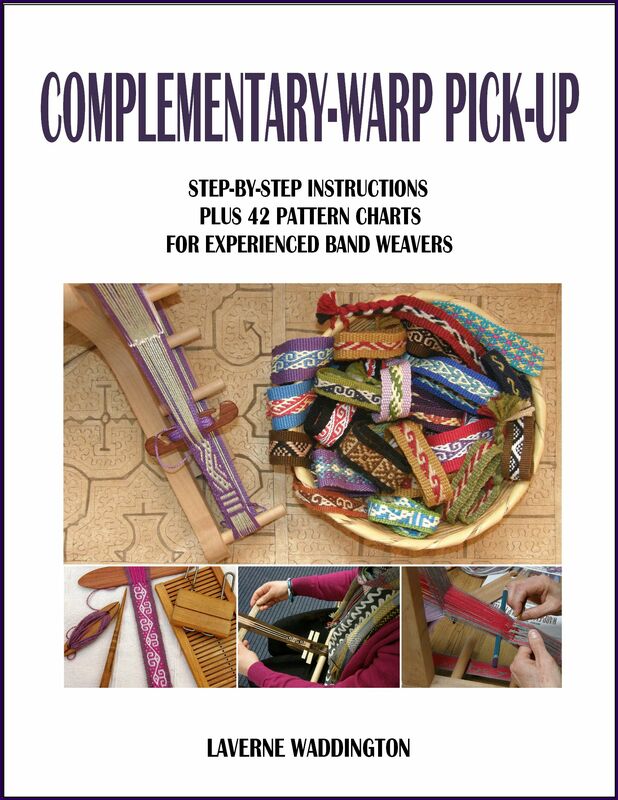 Feb 14 2017: Watch my new video on Basic Warping for Backstrap Looms here. It all starts with a warping board. Above…a homemade one. Sometimes you need to improvise. Finding something FIRM around which to wind your warp is essential. If you think that you will be doing a a lot of weaving it is well worth investing in a warping board or building one yourself. 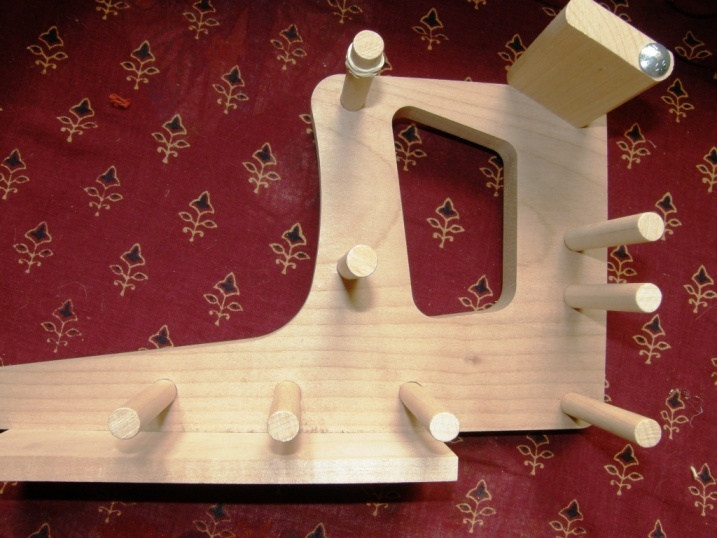 If you are using dowels embedded in a plank, make sure they are firmly embedded and cannot move at all. Leaning warping stakes will seriously affect your warp. “L” brackets screwed into wood work well using one arm of the “L” as the stake. The warping pegs that come with rigid heddle looms are another good option. Clamp two to a table. 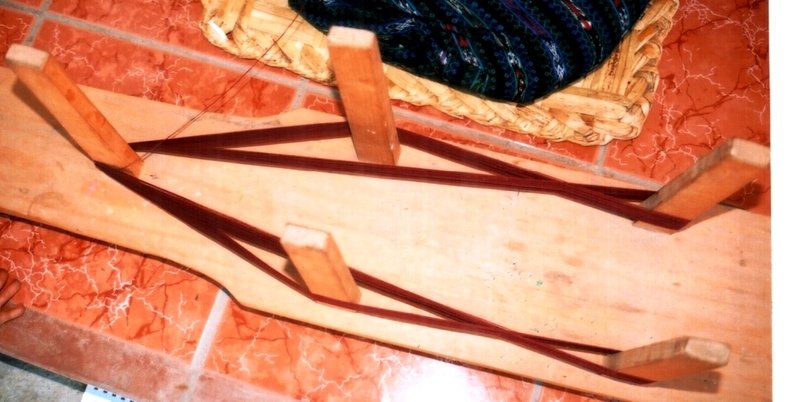 An inkle loom can be used as a warping board using two pegs. 1.Start by tying the yarn in a large loop around stake A. Place the ball of yarn in a bowl or other container so it won’t roll around. Pull the yarn off the ball and lead it to and around stake B. 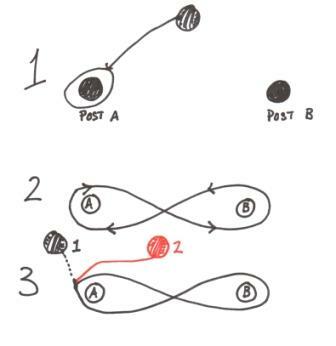 2.When returning to stake A, the yarn needs to cross itself. You are moving in a figure-of-eight path. 3. When changing colors cut and tie on new yarns to each other at stake A. Finish by cutting and tying off the yarn around stake A in a large loop. Concentrate on keeping the tension as even as possible. Try not to stop or pause in the middle of warping. Remember that this warp will go directly onto your loom. A well-wound evenly-tensioned warp will get you started on the right foot with your weaving. Bands with vertical sold-color stripes. Guatemalan weavers use space-efficient set-ups to warp their long warps. The Guatemalan weavers with whom I studied like to put two crosses in their warps. Four-stake warping, which allows you to quickly and efficiently separate out two colors into two sheds on the warping board.. A warp set up this way will produce a band with horizontal stripes. It is also the base for creating patterns with simple warp floats and complementary-warp pick-up structures. 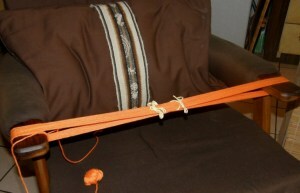 You can learn two basic ways of warping use two stakes and four stakes in my video Basic Warping for Backstrap Looms. This blog post also has a lot of information about warping. Follow up your warping with my video on Operating a Backstrap Loom which is available for streaming or as a dvd on Taproot Video. I had a warping board made with 4 stakes like in your video and have wound a warp like you show. I just wondered what to do with the extra crosses between the middle stakes and the outside one? I would very much appreciate any help you can offer on this. Anita, if you are wanting to create a third selvedge, that is, have your warps on a needle that is lashed to your loom bar, just ignore that extra cross and replace the warping stake with the needle. When your warp is on the loom, and you have made your string heddles and put in your shed rod you will see that that cross will not interfere with anything. Open your heddle shed down to the start and straighten out any overlapping warps on your needle. If you wound your warp with your thumb between the two threads, there won’t be any major twisting. You won’t have a absolutely perfect start but the imperfections are less noticeable the finer the yarn and the finer the needle. If you are staring with a fringe then that extra cross will get “swallowed” in the fringe. In either case, the extra cross there will have no effect whatsoever on teh weaving. just found your website. I found some references to back strap weaving on a Finnish website and couldn’t find any material unfortunately in Finnish. But I’m glad I found your website, you explain everything so well and with great and clear images. Can’t wait to get started 🙂 . Thanks a lot, and good luck with your work! Hi Sami, Thanks for visiting. Are you thinking of doing Finnish-style patterned bands? The ones I have seen are gorgeous. I hope you let me know how you go with it. Hi! I hadn’t thought about it yet, but that’s a really good idea. I’ll need to first get through the basics before trying any patterns. 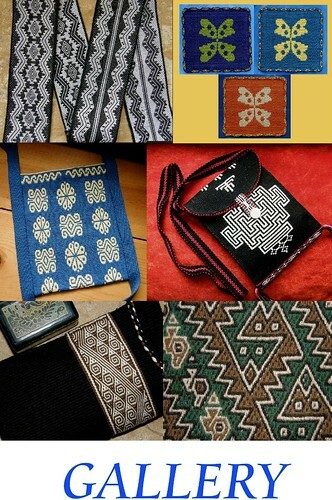 But there really are great Finnish patterns to be found, for instance from Northern Finland (Lapland), where they have used similar weaving technique for belts etc. I assembled in the afternoon a small back strap loom from old miscellaneous stuff and got it warped. Still having problems with the heddles, but I’m getting near my first weavings. I’ll let you know when I get my first work done. BTW It’s my first time with looms :). I promised to tell you how it goes. I got the heddles working when I put the strings on a stick like in one of your videos. The string-only-heddle I couldn’t get to work. I made yesterday 15 cms of blue narrow band. Didn’t take long. I probably did something wrong with the warping or the sheds, because I got weird lumbs and bumps in my weaving. But it was still a lot of fun, and I’m really excited to weave:). Now I just have to learn to make it look better. In practice it’ll improve, I think. Thanks again for your great website. I’m thinking of writing an article on back strap weaving in Finnish when I get it mastered better. Thanks for the update Sami. Keep weaving and you will quickly see improvement…your tension when warping will get better, your heddles will be more even, your edges straighter, fewer bumps and lumps too! Congratulations on having made your first piece! This is a fantastic website. I am trying to make a warping board, and I have seen lots of photos of warping boards with two rows of parallel upright pegs. This seems like a good idea, but I don’t understand where the threads would cross over each other. So far I have only followed your instructions for basic weaving, and have warped using a simple figure of eight pattern. In the case of the two rows of pegs, where would the warping thread cross over itself? I hope this is clear. Thanks Bethan. I posted a picture for you just now on the warping page of a Guatemalan warping board. This is the system with two rows of pegs to which I think you are referring. You can see the cross clearly there. The Guatemalan weavers with whom I studied like to have two crosses. Only one of them is essential. Thank you very much for this picture – I think I understand now. Another question that I have is about the sort of weave that can be done on the back strap loom. I grow and spin linen (not very well as yet) and I want to try weaving it on the backstrap loom. Is this possible, do you think? Also, what sort of weave should be used ? It seems that people normally spin linen using linen weave, or plain weave (I think) but you talk quite a lort about warp faced weaves. complete beginner, and no one I have ever met knows anything about weaving. Bethan, I haven’t woven with linen and so I can’t tell you anything about that. I wrote a post entitled “What is backstrap weaving?” in which I talk a bit about what can be made on this kind of set-up. I made use of all your info about making a warping board (I wrote to you about this on January 10th 2013), and I have managed to make a warping board which really works very well. I do actually have a photo of it I would like to send you, but I can’t work out how to do that via the website. I wonder if you have any tips about how to weave a twill weave on the backstrap loom. I want to do a over two under two weave, but I can’t work out how to arrange the string heddles etc. Anyway, thank you for all the information, I always enjoy reading your newsletter. I will email you, Bethan, and tell you how to use information on a draft for your backstrap loom. Then you can send me the picture of your warping board. 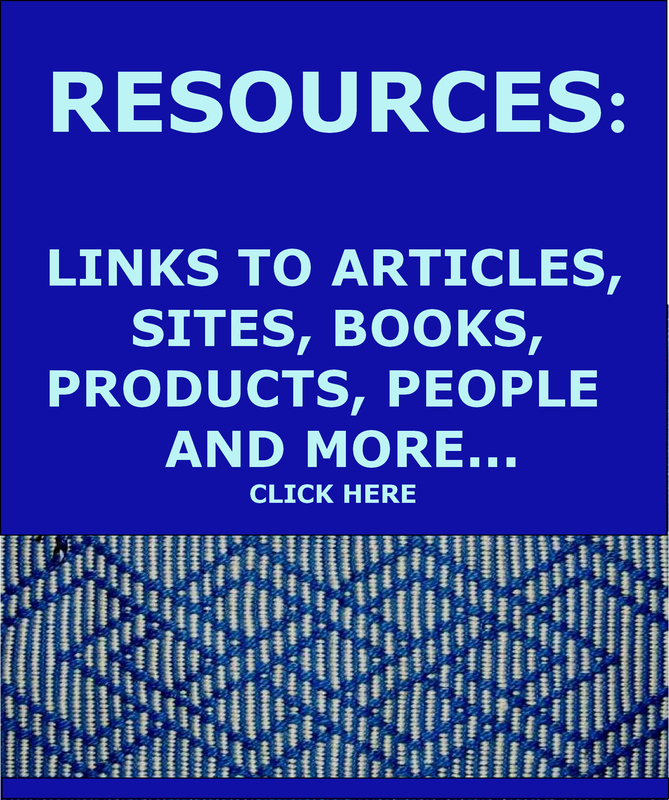 Hi I have been leaning to weave using your blog posts and articles as instruction. Thank you very much! I thought I was doing so well, until I moved on to adding horizontal stripes. I warped a few times, and kept making mistakes, but finally got a thin band on my loom that is working. Except the selvages. They are working OK on the left, but so bad on the right. My first project, a plain weave band worked perfectly. Are selvages just inherently harder with horizontal stripes? Should I wind the warp with an even or odd number of threads? I am happy to hear that you have been getting on well with your weaving. The edges are usually the last part of the process to fall into place. Even when I teach face-to-face classes my students are not able to watch what I do when I place the weft and then go and simply replicate my movements and produce neat edges. There is a great deal of “feel” involved which doesn’t come until you have a certain level of experience. So, don’t be disappointed or frustrated if your edges are not looking good now. Strangely, one edge will always look better then the other. I always wind complete revolutions on my warping board. It could be an odd or even number of revolutions. That makes no difference. Even though you are weaving horizontal stripes, the weaving structure is still plain weave. It doesn’t make any difference which colors you use or how they are arranged. So, the fact that you have horizontal stripes instead of a solid color makes no difference whatsoever to your edges. I am wondering if you are using a third color as your border. 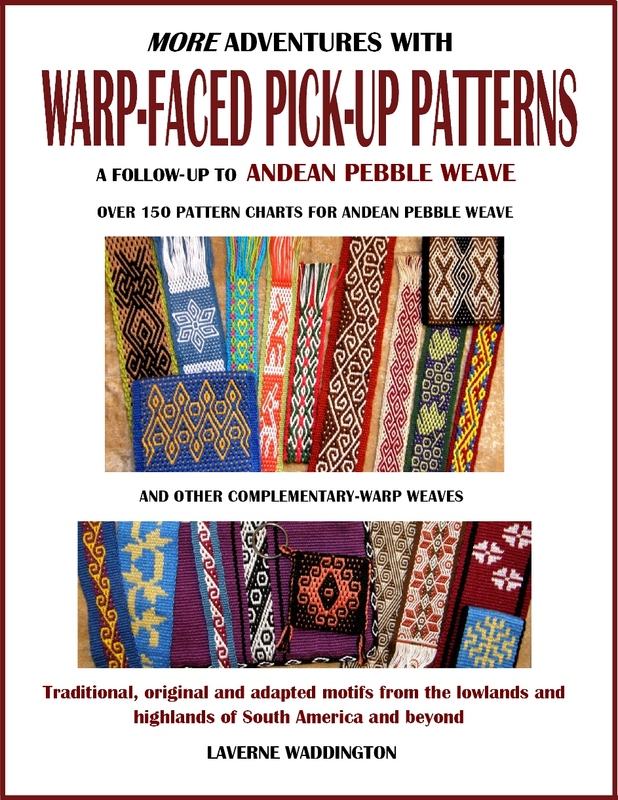 This could create a sort of optical illusion as your eyes will be drawn more to the edges when you stand back and admire your weaving because of the change of color at the edge and you would, therefore, notice more any imperfections that may be there. Keep practicing. Good edges come with experience. I just wanted to say how helpful you have been in my quest to back strap weave. I saw it several years ago and it has taken me a long time to get my collection of sticks together but once i had them I didnt know what to do until I came to your videos and blog. I have made a few bands of varying sizes and widths. I have had a go at patterns just by seeing what I come up with as I go and experimenting. My intention is to get kids I work with in the woods all attached to trees and weaving in the way their ancestors might have. So happy to know that you have found it helpful. I hope the kids enjoy it too. I just wanted to let you know how useful your website is and how much I appreciate your work. I’m quite experienced stitcher but I’ve always wanted to try the weaving. And I thought it is not possilble without any equipment. Today I started my first piece. Thank you for your instructions. And your weaving is absolutely stunning. Thank you, Aleksandra, for your comments! Hi I’m confused about the last step here of transferring to the actual loom. Every time I do this, I get the tension just fine on the warp board, but then upon transferring, all the threads get all mixed up as it goes slack and get jumbled. Then I have to A) spend half an hour going one by one annoyingly putting them all back in order, and B) in doing so, I do so much tugging and rearranging that I lose all the evenness of tension that I had in the first place. Is there some way to like… tie or tape or weave a pick or two plain on the warp board before transferring to force the threads to stay in place and maintain their original tension? Or is it easier than that and I’m missing something? Love your site! Backstraps are so much cheaper than a frame loom and very effective still! There are several things you could do to help stop everything getting in a mess as you transfer from warping board to loom. Firstly, I am assuming that you use sticks to save your cross rather than just string…that is already a big help. If you tie safety strings at the two ends of the warp, never tie them so that they are choking the warp. Tie them loosely and allow the threads to be spread. Here are 4 different ideas…..
1.You could chain some thread around the warp ends as you warp…say, wind 10 revolutions and then chain. You can do this on both sides of the cross. It will help keep everything flat and in order rather than having threads bunch up and overlap. Attempting to insert an image…let’s see if it works. 2. You could warp in small manageable sections….say 20 revs….and transfer the sections to your loom bars one by one. Slide the sections off the warping stakes and onto your hands trying to keepo the warp as flat as possible. I always warp like this when I am creating wide pieces with very fine yarn. 3. 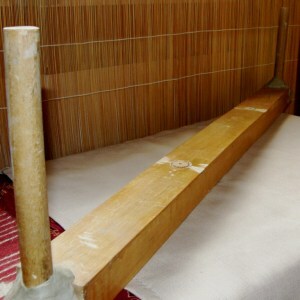 While the warp is still on the warping board, slide your loom bars into the spaces held by the two end warping stakes . Ease the warp off the stakes and carry it away on the loom bars. 4. Ignore the jumbled threads that you have taken off the warping stakes and just pay attention to the cross where things will still be in order. Spread your warps out along the cross sticks as much as you can…use really long cross sticks. 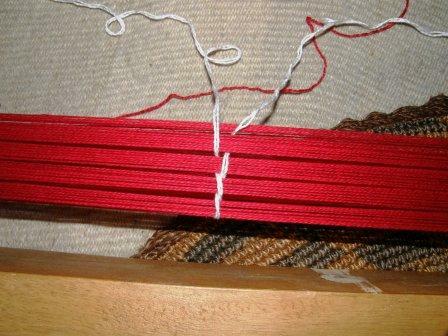 Then gently lift the threads and place them in position at the loom bars. There should not be any reason to wrestle or pull excessively at them. The threads will not be tangled…they are simply out of position. Glad you are enjoying the backstrap loom. Thanks for your comment and I hope this helps. Wow that is a lot of detailed information, I am sure that’s more than enough to get me on the right track when I start my next project, thanks! I’m having trouble changing colours when warping. My knots keep coming undone. Is there a special knot you use? I’ve just been ending and starting new colours with knots, but it gets messy. I use square knots and they don’t come undone. Knots and tails are messy but they are at the far end of the loom well out of the way. Hi im new to backstrap weaving is there any way I can learn how to worp my loom from start to finish, I tryed o youtube but there is limited videos and the onrs they do have thay go so fast and you can hardly see the yarn I have a backstrap loom from guatamala or paru I forgot which. All I can suggest is to watch the first video on this page. Then, look at my Backstrap Basics article (there’s a tab on my blg header) for tutorials on making string heddles and operating the loom. My name is Mackenzie and I found your website a little over a year ago and it made me fall in love with backstrap weaving!! 🙂 I have been progressing through the various styles you have here and am now running into some trouble…I have been warping all my pieces using the clamps you recommend above but I can never seem to create a successful horizontal stripes. So after turning again to your wonderful website I saw how much easier 4 stake warping seemed to be, my only problem is I have no clue where to begin looking to find such a warping board, do you have any suggestions? Also any helpful tips for horizontal stripes? Hi Mackenzie. You can buy some ”L” brackets from the hardware store to use as warping stakes and clamp them to a table. Put some of that rubber drawer liner sheeting under the brackets so they won’t slip. Clamp the two brackets at the two ends of the warping set-up. The two stakes that go in the middle don’t need to be clamped as they simply hold the cross. You can hold them in place so that they don’t wobble around or fall over by using some of the tacky stuff that is sold for putting up posters on walls. Awesome, thanks for the quick reply!! I will look into that. Hi Laverne! I’m a student in Asheville, North Carolina trying to learn backstrap weaving for a project (and for personal enjoyment). I have a very novice question – I can’t figure out how to make my verticle stripes a solid color if the warp color is different from the left color. At the very least, the warp shows up on the very edge of the piece. For example, I’m trying to leave a white band with two thin blue stripes in the middle. The edge looks fine because I’m using a white weft, but I still see white showing up on my blue. I’m using the first basic warping method you show on this page (not the false cross one). Is this just a problem of spacing/tension? Hi Kalia. The warps I prepare in my video are for warp-faced bands. That means that the only place you see the weft is at the edge where it exits one shed and enters the next. The warp threads should be sitting close enough together to hide the weft. It sounds like yours are not. Some weavers have the warp threads very snugly pushed together. Others leave just a hair’s breadth of space between them and then there’s a whole range of options in between. All make for good warp-faced bands. The weft should not be exposed. I hope this helps. 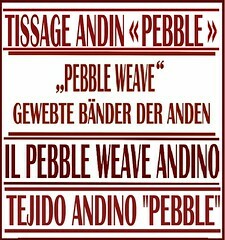 I wish you all the best in your weaving! Any advice on warping dovetail warps? For a small one I replaced the bar with a loop of string, but I want to make a wider warp, so I assume I’d just keep the bar in there? I just like the circular warp route because I can sit in the same spot for two hours as I weave. But I keep screwing up at warping and ending up with tons of wasted tangled string, which makes me so mad I just want to set it on fire. Is there any reason you want to do a dovetail warp rather than a full circle?